Tools for exploring and communicating the impact of uncertainty on spatial prediction are urgently needed, particularly when projecting species distributions to future conditions. We provide a tool for simulating uncertainty, focusing on uncertainty due to data quality. We illustrate the use of the tool using a Tasmanian endemic species as a case study. Our simulations provide probabilistic, spatially explicit illustrations of the impact of uncertainty on model projections. We also illustrate differences in model projections using six different global climate models and two contrasting emissions scenarios. Our case study results illustrate how different sources of uncertainty have different impacts on model output and how the geographic distribution of uncertainty can vary. 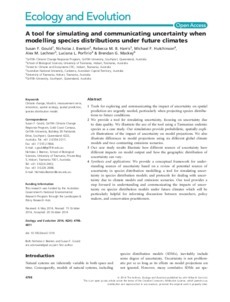 Synthesis and applications: We provide a conceptual framework for understanding sources of uncertainty based on a review of potential sources of uncertainty in species distribution modelling; a tool for simulating uncertainty in species distribution models; and protocols for dealing with uncertainty due to climate models and emissions scenarios. Our tool provides a step forward in understanding and communicating the impacts of uncertainty on species distribution models under future climates which will be particularly helpful for informing discussions between researchers, policy makers, and conservation practitioners.